No one can put a price on the value of an attractive smile. Teeth that are healthy, white, well aligned and correctly proportioned are essential components of a smile that gives you confidence. There have even been studies done to support the importance of having a good-looking smile. The research proves that a beautiful smile can lead to a life that is happier and more accomplished. For this reason, a cosmetic smile makeover can be a very wise investment in yourself. At Ascot Aesthetic Implants & Dentistry, Dr. Ruff offers a number of cosmetic dental services to help you have the smile you deserve. Why Choose Ascot Aesthetic Implants & Dentistry for Smile Makeovers? The terms smile makeover and full-mouth reconstruction are often used interchangeably. However, they are two different procedures. A smile makeover is elective and is performed strictly to improve the appearance of your smile. Full-mouth reconstruction involves a set of procedures performed to restore oral function and health, often resulting in the same improvement in appearance as does the smile makeover. Both can equally help in terms of self-confidence and self-esteem. When determining the best color, we want your smile to look brighter and natural! Alignment: A smile with straight teeth is not only more attractive, but healthier and easier to keep clean. In some cases, porcelain veneers can make slightly crooked teeth appear straight. Other times, realignment with orthodontic treatment may be required. Tooth Loss: The absence of even one tooth can not only impact the appearance of your smile, but will also lead to adjacent teeth tipping as well as opposing teeth super erupting, making replacement challenging in the future. Dr. Ruff offers several options for tooth replacement. 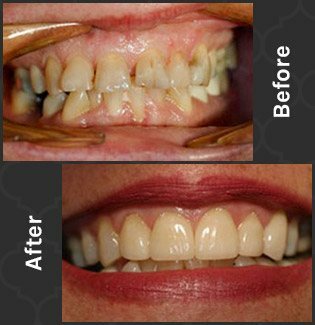 Balance: To make sure you have well-proportioned teeth and an even gum line, Dr. Ruff can perform cosmetic bonding or porcelain veneers to reshape or lengthen teeth. In the case of a gummy smile, Dr. Ruff can perform a gum lift which results in a more pleasing ratio of gum to teeth.